While Douglas Coupland works on a grand art project about Canada, the writer recounts his life and his musings about the various aspects of Canadian identity. 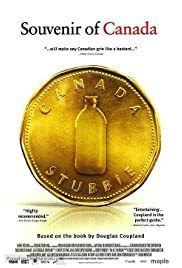 Souvenir of Canada is based on the books of the same name by Douglas Coupland (Generation X), who also narrates the film. The film is a nostalgic look at Canadian pop culture and identity, which frames a look back at Coupland's childhood and his relationship with his family. The movie also follows Coupland's efforts to build an art installation called "Canada House" in a soon-to-be-demolished home. Using a variety of techniques, from animation to clips from old films and shows to interviews with Coupland and his family, Souvenir of Canada provides a humorous, quintessentially Canadian look back at our past and our cultural identity. I think that any Canadian who grew up around the late 60's or into the 70's would have an appreciation and fondness for this film. Just seeing some of the artifacts that Coupland digs up evokes a strong sense of childhood and the past, from road trips down the Trans Canada to stubbies to Terry Fox's sock to Windsor salt boxes, stuff that as Coupland puts it, wouldn't be recognizable to anyone except someone who grew up in Canada. Director Robin Neinstein stayed for a Q&A after the screening: - The Canada House installation took about two weeks to make, and was only up for five days. Neinstein first read Souvenir of Canada in Indigo, in one go at the store. He eventually found his way to Coupland and flew out to Vancouver to meet him. Coupland at the time was just thinking about the Canada House project, building some of the furniture for it over the past year, and they both decided it would make a good foundation for the movie. Someone commented on how Coupland's narration evoked memories of the Hinterland Who's Who spots we all grew up with. Neinstein said that wasn't necessarily intentional, but that they did try to make everything feel like a memory. Non-Canadians seem to enjoy the film. In one of the early screenings, Neinstein said two British people in the audience immediately wanted to watch the film again (Neinstein likened it to an interesting anthropological look at aliens). Coupland didn't want to have any Canadian celebrities in the film; he wanted to concentrate on objects that we have all shared. The one exception was Terry Fox. Music was done by A.C. Newman from the Vancouver group The New Pornographers. They wanted a very west coast Canadian sound. Newman had wanted to work with images rather than write lyrics; Neinstein cut the music into the film as they went. When asked what it was like to work with Coupland, Neinstein said that Coupland's brain is always racing, looking from multiple perspectives (past, present, future), and that he is endlessly creative. Coupland's parents have not yet seen the film, but Neinstein imagined they would when they bring the film to the Vancouver International Film Festival.